When I was a kid growing up in Ohio, my mom had a huge garden in our backyard. I’m talking HUGE. She spent many hours tilling the soil, fertilizing, and planting vegetable and fruit seeds in neat rows. It really was a lovely garden. Guess whose job it was to harvest it all? Yup, me, and I didn’t enjoy it. It was just plain work as far as I was concerned. But after some time, I grew to love the peacefulness of being outside, discovering where the ripe green beans and peppers were hiding, and the challenge of avoiding stepping on the strawberries. But, the best part was eating everything right there on the spot. It’s probably why many people compare me to a rabbit all these years later. Some years were better than others for growing a good garden, of course. The weather and bugs have a way of doing their own thing, but Mom always did her best to keep the soil at its best. In the years the soil was difficult to maintain, the harvest was a bit light. 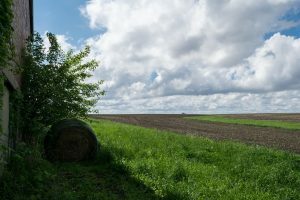 But, in the years when Mother Nature cooperated and we had good soil, the harvest was a bountiful cornucopia that would make any pilgrim proud. Now with kids of my own, I attempted to recreate my mom’s Ohio garden in my Florida backyard with one of my sons last year. Yeah…that doesn’t work as well as you might think. The soil here (at least in my yard) is half dirt, half sand. Weeds grow far better than any grass can. Then there are the usual garden pests, including hungry squirrels. We gave it our best shot. By the time the growing season was over, the only thing that had survived was a single marigold plant. Oh well. There’s always container gardening. What I learned is that planting good seed is essential, and putting in the time to maintain a successful garden is hard, time-consuming work. But, the most important part of any successful garden is the quality of the soil. Jesus often used parables to make His point. The problem is that usually they sounded like big riddles. So, let’s dissect them into more manageable, plain English-speaking parts starting with the one about the sower. Apparently, Jesus knew the value of good soil. He relates it to growing our faith in the book of Matthew when He talks about the parable of the sower. You may have read it before, but if you haven’t or you forgot some of it, you can hop over here for a quick brush-up (not an affiliate link). Jesus breaks the different soil types into three basic categories: hard-packed dirt, rocks and weeds, soft soil. Imagine walking along a path through a forest or field that gets a lot of visitors, like at a local park. The path is walked on so much that the dirt is pretty much like concrete. This is the first type of dirt Jesus mentions, the hard-packed dirt. The second type of soil isn’t even soil, it’s rocks and weeds. The rocky places Jesus refers to are bedrock areas covered in a thin layer of dirt. When you first look at it, the dirt might look fertile, but when you dig into it you find that it’s not deep enough for any healthy roots to grow. Jesus also refers to weeds or thorns growing where the seed is planted. Even after the growing season is over, the roots of the weeds are still there in the soil. When it’s time to plant again the weeds keep the good plants from prospering (kind of like what happens in my yard, ha). The third type of soil is soft and fertile. It’s the kind that has been carefully hoed and tilled, fertilized, cleared of weeds and rocks, and conditioned to grow some seriously good plants. Each type of soil represents the heart of every person. For one reason or another, some of us have a hard-packed heart, some of us have weeds or rocks in the way, and some of us have soft, fertile hearts that are eager to produce good fruit. What kind of seed is Jesus talking about? The seed is God’s word. We can’t grow our faith if the Word is planted in soil that either isn’t prepared for it or just doesn’t want it. Now, let’s look at what happens when the seed is planted in the different soils. 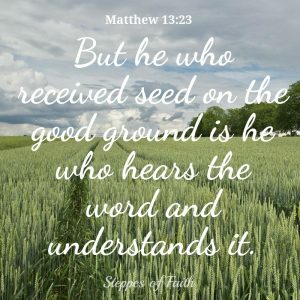 With the hard-packed soil, Jesus says that the sower tossed the seed out and some of it “fell by the wayside.” The wayside was the path that bordered a farmer’s field so the workers could easily access the crops. These paths were beaten hard by foot traffic and general use. When the seed fell by the wayside, the birds took quick notice and swooped down to eat it all up. In the rocky places covered with soil, the seed tried to take root, but the soil was too shallow. So, when the hot sun came out, the heat burned the sprout and dried up its fragile roots. If the seed fell among the weedy, thorny areas, the parasitic weeds choked the sprout and took it over so it couldn’t grow at all. Jesus is trying to tell us to be mindful of the condition of our hearts. If we are hard-hearted, God’s word will be gobbled up by the evil influence of others working (unknowingly) on Satan’s behalf and we’ll forget what we learned before it can take root. In a rocky heart, we hear the Word and it begins to penetrate our heart, and we feel excited about our new-found faith. But, when stress and trouble come around we begin to panic and doubt God. We begin to think He let us down, that He’s forgotten us, that He doesn’t care, that we were tricked. We somehow had the false impression that life would be easy-peasy from here on out. So, we quickly give up on God and the whole church thing thinking that God isn’t all He’s cracked up to be. Likewise with the weeds. 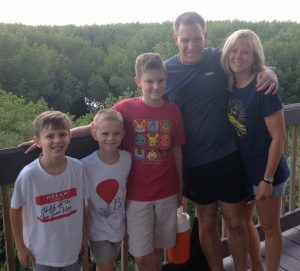 We hear the Word and we’re genuinely interested, but other things become more important– things like work, our kids’ sports schedules, sleeping in, our favorite Sunday morning TV show, taking the boat out, a local event. Going to church sounds great, but only if it fits in with our schedules. God isn’t priority enough and, eventually, we forget what we learned and why we were interested in the first place. 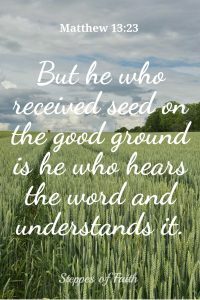 But whoever hears the Word and understands it, if its meaning grows deep roots in our heart, then we have hearts made of good soil. The result is we will produce good fruit in our lives that multiplies as we live out our faith. This is the kind of heart Jesus is seeking for His kingdom. In the middle of all this, Jesus tells the crowd in Matthew 13:9, “He who has ears to hear, let him hear!” What does He mean? Not everyone wants to hear God’s words. Not everyone wants to admit who He is, His power, His sovereignty, and certainly not His judgment or glory. But for those who have hearts made of soft soil, they also have ears willing to listen…and to learn. Only those seeking God will truly understand Him. They are the ones who will see things through God’s eyes and hear through God’s discerning ears. They are the ones who will produce good fruit. What kind of soil do you have in your heart? 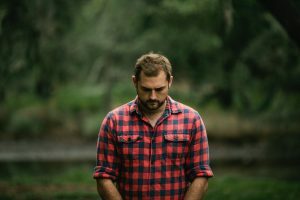 What happens to the seed that God tries to plant in you? Does it go by the wayside? Fall on rocks or among the weeds? Or do you have soft, fertile soil that welcomes God’s instruction and love? Take a quiet moment and examine your faith. Explore what your view of God is and the status of your relationship with Him. It’s okay to be honest with yourself because He already knows. 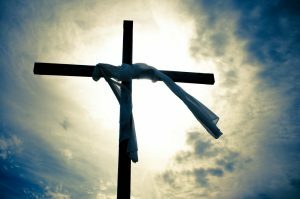 If Jesus’ message is tugging at your heart, it means He’s trying to open your eyes and ears, to soften your heart so it becomes fertile ground for His grace and love to grow. He wants you to be strong and healthy in your relationship with Him knowing that in His presence is joy forevermore. As the old saying goes, it only takes a little fertilizer to make a flower bloom. Allow God to make your heart and relationship into a beautiful garden rooted in Him. 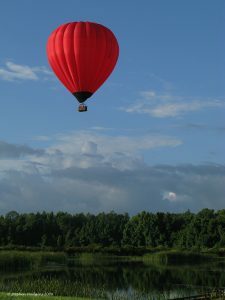 Have you struggled in your faith and found a way to keep your heart soft toward God? What ways did you use to draw close to Him? Please share your methods and thoughts with us either here or on my Facebook page so we can all be encouraged. We’d love to hear from you. 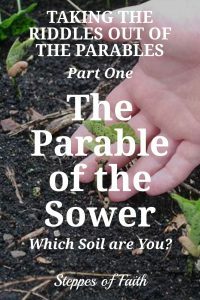 My friend, Deborah Bateman, does a great job of explaining the parable of the sower over on her blog. Here’s the link. 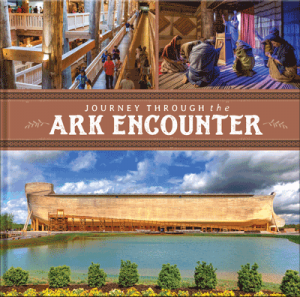 She also created an ebook about the book of Matthew that you can purchase and go into greater depth of the parables. I pray it encourages you. Great article! Very easy to understand. Thank you! Amen! Me too. Thanks for reading, Donna. Be blessed today! Hi Gina, I appreciate your post. It’s very clear and helpful in understanding the aspects of this parable. I especially like the application at the end. As for me, I find regular prayer time in a quiet, private place is the best nourishment for my relationship with God. It can be hard to stay still and focus on Him, but it’s more than worth it. 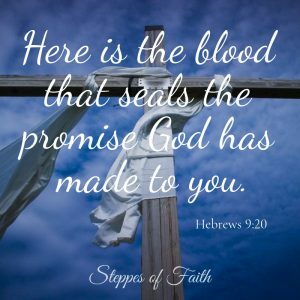 Blessings to you in Christ! I completely agree, Emily. It’s hard to be still with God, but it’s only through that quiet time that we really get to know Him and grow our relationship with Him. So glad to know you’re seeking Him every day. Thanks for stopping by. God bless!